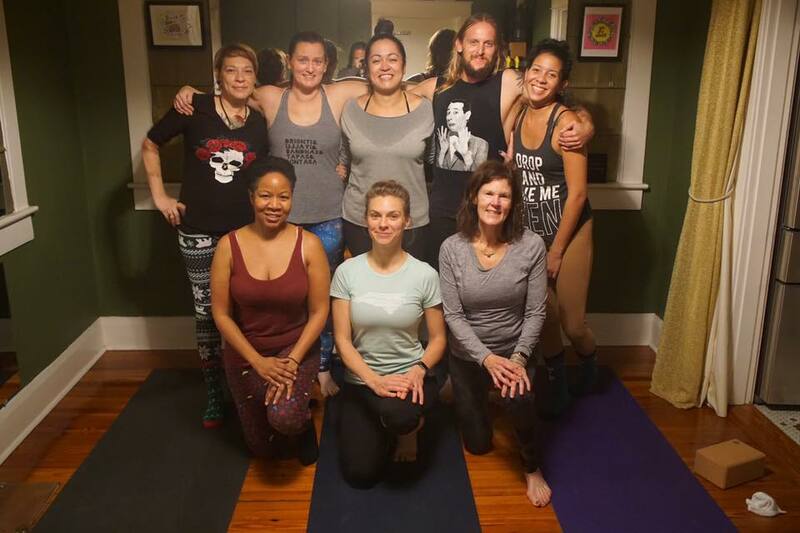 I began teaching yoga from a back room of our home in February of 2017. Here are a few things I did to make the space inviting for practicing yoga. The room is 10x14 and it connects to the kitchen, therefore I made a curtain to divide the room off from the kitchen and provide a neutral place to rest one's gaze. The curtain is double sided - one side is a glittery gold lightweight fabric and the back side is a curtain liner fabric I bought from JoAnn's to obscure the view into the kitchen. It isn't light blocking but it does keep the visual discord of the kitchen hidden from the yogi's view. I used 1/2 electrical conduit piping from THD for the curtain rod and the rod is held up with two 1/2" copper bell hangars (designed for holding plumbing pipes at a distance from a wall. I used a grommet kit like this one to put grommets in the top of the curtain to hang it from ball chain on the curtain rod. I bought a spool of #10 ball chain & the couplers from BallChain.com. The space has a ventilation duct in the floor which I've blocked with a piece of hard board. I cut the hard board down to fit the vent grill, painted it matte clear and glued two large magnets to the top of the piece. This keeps the AC from coming up into the room when class is taking place. The space heater I found after researching space heaters in home yoga rooms is the Dayton 1500/1000/650W. The room also has a temperature/humidity monitor as well. It takes about 45 minutes for the Dayton to heat the room temperature to 80F in the fall. The room naturally gets warm due to the West facing wall in the summer. Two of the four walls have lots of windows which I've covered with large mirrors that I've found via Craigslist. There are also two rectangular mirrors on the bottom of the walls so that the yogis can see their alignment in seated poses. I would have liked floor to ceiling mirrors but the design of the windows is such that it's not possible to do this without a major effort. 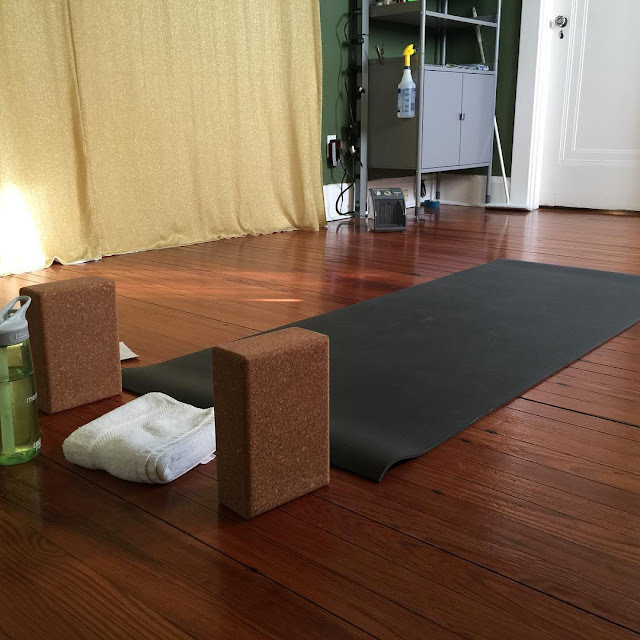 Over the past year I've been entreating neighbors, friends of neighbors and people I've met in the neighborhood to come over, get on a mat and practice yoga in order for me to practice teaching. It has been hugely rewarding to bring yoga to the neighborhood in a grass roots fashion. The beautiful thing about this room is that if I need to expand the space and include the kitchen, I can move things around in the kitchen to make space for another three mats! The 10x14 space can fit six mats North to South and three mats in the kitchen facing West.